Life in de road is demanding and requires a balanced diet to stay healthy. Before we left the first time, we didn't have any clue on what to expect of the food along the road. It turned out it usually isn't a problem to find something to eat. In most countries we crossed so far, (street)food usually is pretty cheap. We really like to try the local cuisine. However for those times there isn't much to eat or for the more expensive countries we carry our own gear to prepare something ourselves. On a worldtrip by motorbike a fuel stove really is a no brainer. Unlike gas, fuel is available almost everywhere and the bike is running on it. Also petrol can burn on any height and in cold conditions. In the Adventure Motorcycling Handbook by Chriss Scott the Coleman Sportster 533 stove is recommended. So when we ran into this burner for 60 euro on Marktplaats.nl we immediately bought it. During our vacation to Norway in 2011, the burner proved itself. We frequently used it and we liked it pretty much. In Africa we only had a couple of issues with this burned. Mainly due to very poor fuel quality in Congo. However each time we were able to fix the burner. But unfortunately during our last trip problems started to happen with this stove. The generator got clogged because of the bad African fuel. We swapped it. But that wasn't all. Because of the cold weather the pump wasn't functioning properly. We replaced the seal and finally the entire pump. But problems persisted. And when Marianne dropped her bike in Albania her panniers were smelling like fuel. The pump wasn't sealing anymore. Back in the Netherlands we started looking at an alternative. To avoid the leaking of fuel inside our panniers we decided to go for a system with a detachable fuel canister. After some research we decided to buy the Primus Omnifuel. The Primus Omnilite which is basically the same burner only lighter got some good reviews. A couple we know are also using the stove during their motorcycle worldtrip. A big advantage of this stove over other systems is that the pump is made of metal instead of plastic. 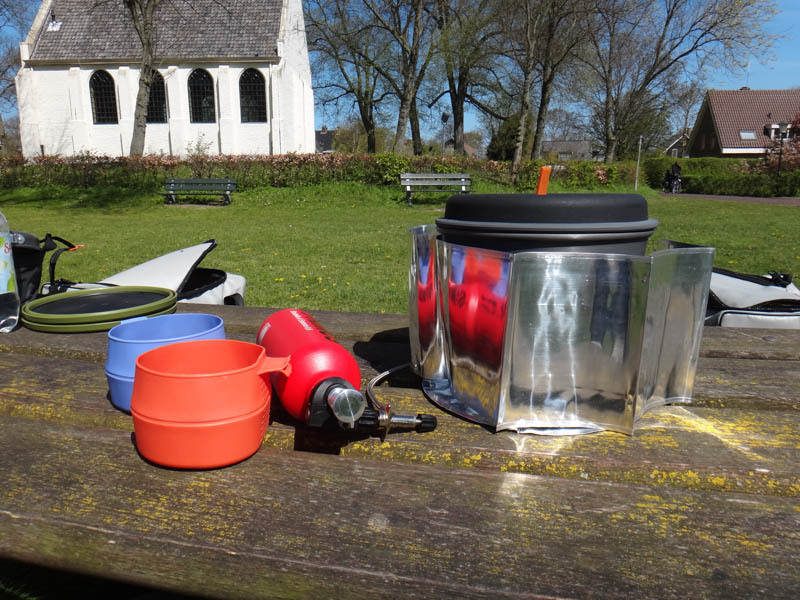 During a test run on Texel we used the stove. And we must admit it works pretty well. Bringing it to pressure is now something Marianne can do. A task she's been struggling with on the Coleman. Lighting the stove is a bit harder opposed to the Coleman as it requires priming. But once you know how that is done, it's not a lot harder to light the stove. Turning it off requires to turn over the fuel bottle. However the stove will continu to burn for another minute or so. So we still need to find the point of turning the bottle to minimize the waste of fuel. A minor drawback is that the stove is a bit loud. We decided to buy a Quietstove to turn down the volume. It really works the stove will get much quieter and also the heat distribution is improved. But lighting the stove gets a bit harder and once the Quietstove is hot, it takes some time for the Quietstove to cool down. We don't think the advantages outweigh the disadvantages of the stove and decided to leave the Quietstove at home. All parts can be fitted inside the biggest pot, which is covered by a lid and closed with the handle. The system really works, but has got one major drawback. At least the version we have. The problem is that the bottom is elevated to much. Making it impossible to stir properly. Although the anodised big pot should be non-stick, this allows food to stick to the pan and burn. It seems this problem has been addressed on more recent versions of the system, at least they appear to have a much flatter bottom. We tested this set during our test run on Texel. And we like it very much. As far as the GSI set is concerned, it has a little less capacity as the MSR. But still it can hold plenty of food for two persons. The flat coated bottom, makes it really easy to stir and is very easy to clean. The corrugations on the bottom make it very stabble on the stove. Also the removable grip functions very well. Before we tested the set we we're in doubt about carrying another one. But it actually operates so easy, we don't see the point in that. If there is one drawback, it is the carrying bag. But it actually is a very small one. The carrying bag is really good for storing the pots in, but less suitable for doing the dishes. The large snugly fits in it, so it's a bit hard to wash it. For this purpose we are carrying an Ortlieb kitchen sink. Which allows more space for the largest pot, but can be folded to minimize storage room. Another disadvantage for those who do hiking or something like that where every ounce counts, might be the two different lids. It just adds a little bit of extra weight, but the advantage is that both pots can be covered to keep the contents warm. Also the frying pan is said to be a little impractial. But we haven't tried it yet so we don't know. With the new GSI set also new cups we're needed. We decided to give the Wildo Fold-a-cup a try. They can be folded so they only take half the space. We bought the big (600ml) version. With a content of 400ml (about the same as the MSR insulated mugs), they are still manageable. They are sturdy enough to support our coffee drip. And what surprised us the most is that they don't get too hot to handle with coffee or tea in them. What could be considered as a drawback is that they don't provide any insulation. So any hot contents will cool down pretty fast. Initially bought as a general purpose multi tool, this piece of equipment is part of our kitchenware. On the road we use it on a daily basis. Whether it is to saw a wooden beam or to slice a piece of bread. The knives are very sharp and they stay sharp. We really love them for cutting meat and vegetables. The serrated knife especially works well on bread. After (ab)using the tool, some of the components broke off. But they have been replaced under warranty by Leatherman. That's what we call service. One of the things we really missed during our Nordkapp trip, was a cutting board. We used the plates and lids of plastic containers instead. But as the Leatherman is so sharp, they are now covered with cutting marks. First we ran into the Coghlans cutting mat, which is no more than just an A4 size sheet of plastic. But we loved it! It stands up to the cutting force of the Leatherman and takes up no space at all. However because it is such a thin sheet of plastic, it requires something to cut on. When we were travelling with Trax panniers that wasn't really an issue, we used the top of the lids. But now we have soft bags and touratech panniers which are not so easy to detach, we have a bit of a challenge. Of course we could use the back of our Sea to Summit X-Plates. But we don't like to make cutting marks in them. Besides if you use them for cutting, you have to use what's on the board before you can eat. Fortunately a local shop called Action provided a solution. They have a very cheap hard plastic cutting board. Smaller than the Coglans flexibel mat. But large enough to cut on and support on your knees. We bought this Bo-Camp BBQ as a bit of a gimmick and never really expected to use it. But once we did, it didn't dissapoint us. We've used it a couple of times in Namibia and South Africa. It's a bit of a puzzle to put it together, but that can be quite entertaining. Because it is fully detacheble it is super easy to clean. Once packed it is very small and takes up little space. On the down side it does weigh a bit. And the screw in cap can pop out easily.